We think few netbook users know what Clevo is, but some assured their brand-named laptop vendors like Voodoo, Alienware, Sager and Hypersonic do for sure. Each day we can see new advanced laptops and netbooks announced, they often really have some amazing features and marvelous innovations attract the PC fans from everywhere. The Taiwanese producer Clevo has announced its new compact netbook TN70M. Last March CeBIT exhibition in Hannover, Germany, took place. The company showed a number of its specialties there. Then, several months later, the company started deliveries of its netbook to the shops. 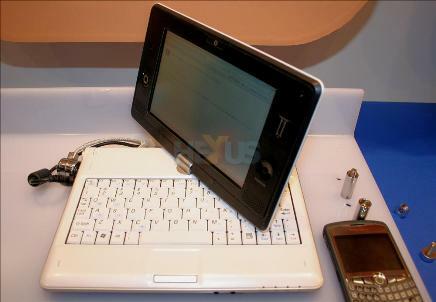 Let’s have a close look at the netbook Clevo TN70M. First of all we can see that the size of the unit is small. So is the 7-inch sensor display. However in spite of its minuteness it has quite a decent resolution, 1024х600 pixels. Besides Wi-Fi and GPS are realized, therefore software Clevo TN70M being installed could work as GPS-navigator. If you are a user of Express Card you can find a slot for that in the device. The netbook Clevo TN70M is able to work within six hours between recharging operations. The netbook is made on the basis of Intel Atom processor.